Lopez says that help has been piecemeal since the storm hit. "We feel forgotten," she says. 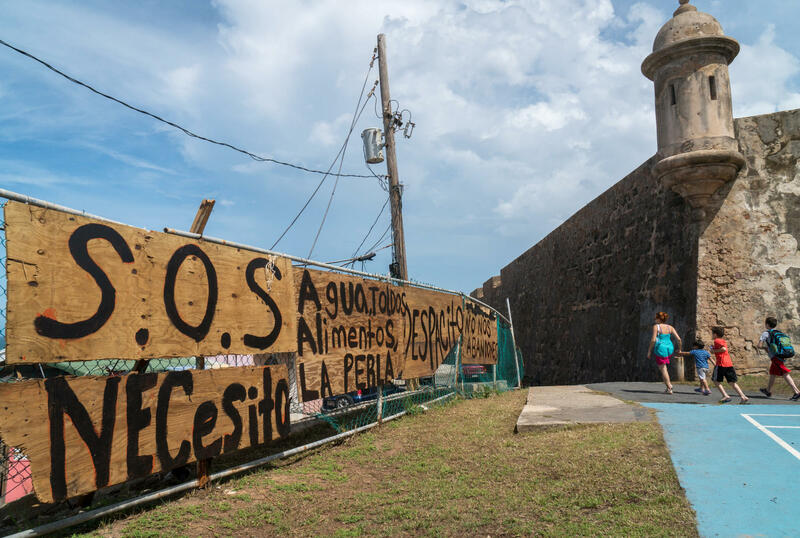 Residents set up signs asking for help in the basketball court of La Perla neighborhood in Old San Juan, Puerto Rico after Hurricane Maria's destruction. La Perla is where the "Despacito" video was filmed. Carmen Lourdes Lopez, 58, walks in the La Perla neighborhood. Over the summer, she was giving "Despacito" tours to people visiting Puerto Rico. 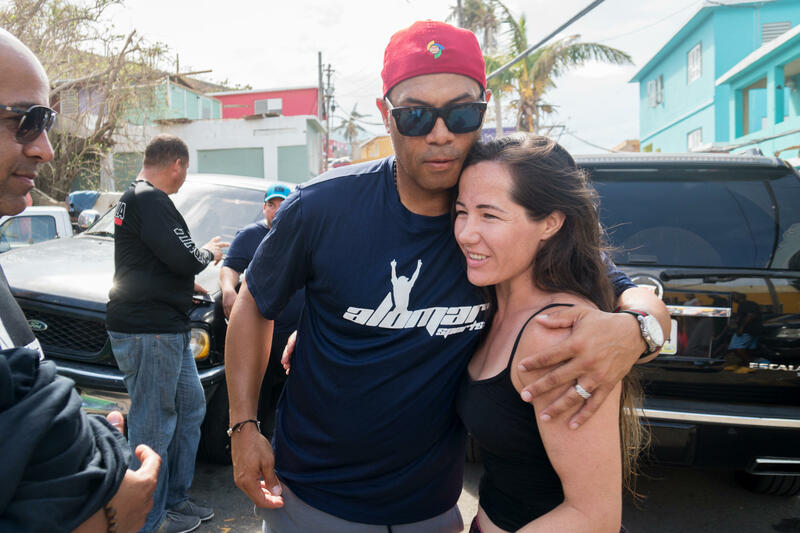 Baseball Hall of Famer Roberto "Robbie" Alomar hugs resident Angela Magaña after delivering aid in La Perla. Alomar grew up in Puerto Rico. 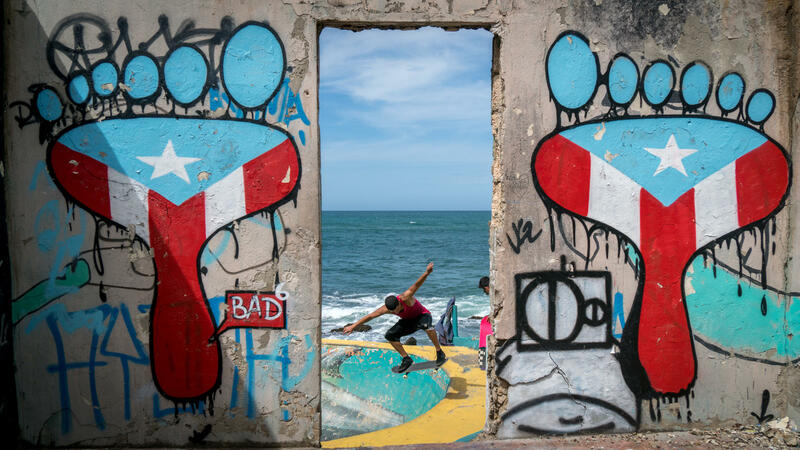 Skateboarders use an empty fish bowl in La Perla. That's a reference to this summer's hit reggaeton song, "Despacito" by Puerto Rican artists Luis Fonsi and Daddy Yankee. The song's video was filmed in La Perla. With a record-breaking nearly 4 billion views on YouTube, it has brought a new kind of fame to a neighborhood that had been known for drugs and violence. Residents point with pride to the street corner where Fonsi and Daddy Yankee sang in the video, surrounded by neighborhood kids. Over here they danced and played dominoes. And over there, sultry former Miss Universe Zuleyka Rivera sauntered around the neighborhood. With the success of "Despacito," there were great hopes that this long-neglected barrio might turn a corner. One La Perla resident, Carmen Lourdes Lopez, says this summer she gave "Despacito" tours to curious tourists from as far as China and California. Then the hurricanes hit. First Irma, then Maria. 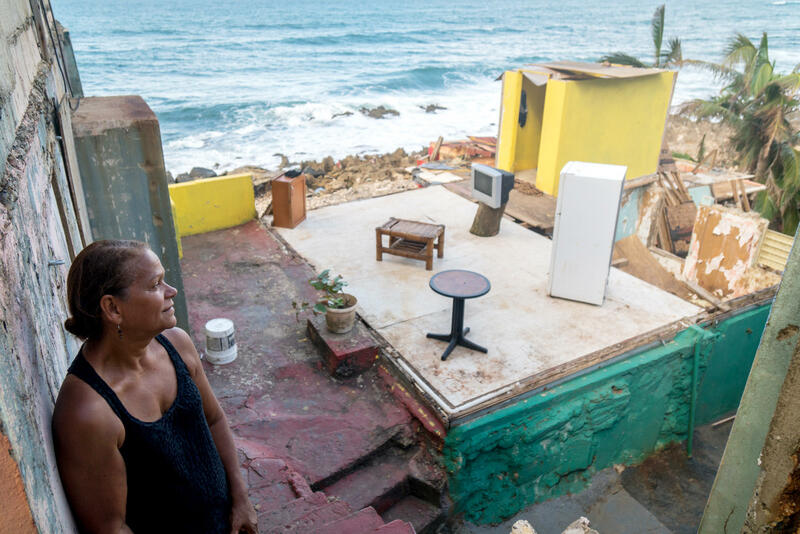 Many houses in the neighborhood flooded, and a few collapsed completely, leaving people homeless and sleeping in the ruins. "We feel forgotten," says Lopez. So far help has been piecemeal. On Sunday, Robbie Alomar, a baseball Hall of Famer who grew up in Puerto Rico, rolled through the neighborhood handing out water bottles, canned food and T-shirts. "I just wanna bring joy back to the people here," he said. San Juan Mayor Carmen Yulin Cruz was here one night, handing out small solar-powered lamps. A few Baltimore police officers and a kindly neighbor from the National Park Service brought water. But La Perla is still waiting for the government to step in. Helicopters and planes roar overhead, presumably carrying supplies. But people in La Perla don't know when or if they'll receive them. They've been cleaning up the debris themselves and helping each other. 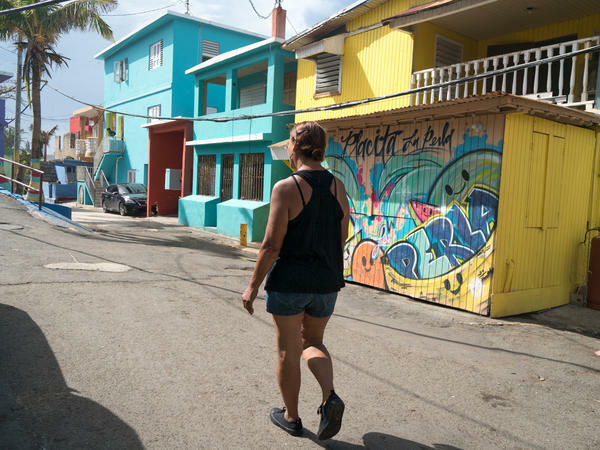 Next to a cement skateboard park painted with graffiti murals, Yentil Ramirez, 26, sighs. "La Perla has a bad reputation of being an underworld den of drug dealers and criminals," she says. "But that's not true. We are like family. We help each other." "The area is demolished," says Angela Magaña, a UFC fighter who lives in La Perla with her boyfriend and their three children. Her neighbors' homes collapsed, and many of them are sleeping at her house now. "They have no other shelter. We need these houses rebuilt," she says. Magaña had planned to open a boxing gym in La Perla, but now she's raising money to help her neighbors. She was unaware President Trump was coming to Puerto Rico on Tuesday. "We're completely cut off," she says. "I had no idea. What is he trying to do here?" Magaña and her neighbors say they don't trust Trump. They worry that instead of being rebuilt, La Perla could get turned into luxury beachfront property. People here are still waiting to find out what's next for them. "Help is coming little by little," says Gabi Lopez, who's lived here all his life: "Despacito." In English, that means "slowly." "Despacito" could just be the theme song for Puerto Rico's recovery. Lauren Migaki contributed to this report.